Eighty years ago this month, on November 5th, 1937, The Old Mill was released to theaters. This is one of my favorite Silly Symphony shorts because it had no dialogue and relied solely on the visuals and music to tell the story. It was also groundbreaking for new innovations and technology that were full of exploring, testing and experimentation. The film was directed by Disney Legend Wilfred Jackson, who went on to be a sequence director on all the Disney animated features up to Lady and the Tramp. However, there is a “credits page” from the films story sketch binder that lists Graham Heid as director as well, but based on The Old Mill story notes from 1936, he was an assistant director according to Didier Ghez. Heid did direct the Silly Symphony short Wyken, Blyken & Nod and later became a sequence director on Bambi. The Academy Awards Program for cartoon short does list Jackson as the director in that 1937 document. The Old Mill is truly a celluloid feast about an old mill and the surrounding property which is host to an abundance of wildlife—birds, mice, bats, frogs, an owl, etc. The structure and its inhabitants are threatened by a fierce summer storm during which the mill looks like it might collapse from the gusting winds. Aside from a slight list, the old mill survives the brutal forces of nature and by morning the sky is clear and the environment is calm once again as dawn arrives. The film’s centerpiece, an old abandoned windmill in the country is lush, detailed, and full of depth showcasing the masterful artistic skills of the studio at that time. The layouts were done by Terril Stapp, who had also done layouts on The Band Concert and Woodland Café. He went on to do art direction on Snow White and the Seven Dwarfs, Pinocchio, the Night on Bald Mountain and Ave Maria sequences in Fantasia, and Dumbo. The short begins as a tranquil scenic, dusk to nighttime, setting complete with nocturnal bats leaving the attic of the mill for the evening. This establishing shot draws the viewer in to explore the natural world with vignettes of fauna that inhabit the location until a summer storm starts to build, complete with blowing wind, pelting rain, and lightning further tattering the old mill. The film relies heavily on the rich, flourishing settings and the cinematography to help move the story along. The languid camera moves and longer scenes in the beginning of the short make way for the contrast of some fast cutting as the storm builds to a climatic crescendo of a lightning strike causing the mill to lean further to one side. As the storm subsides and passes, it makes way for daybreak and the bats return to their perch in the rafters of the old mill. The animated effects and camera/optical techniques developed and honed on The Old Mill were also employed in the first animated feature film, Snow White and the Seven Dwarfs, which was in production at the same time and released about six weeks later. Many of the legendary Disney effects animators worked on this short including Cy Young, Dan MacManus, George Rowley and Ugo D’Orsi among others. These were the artists that formed the first special effects department at Walt Disney Animation Studio. Prior to a formal special effects department, the character animators did much of their own effects animation where needed which was inconsistent from artist to artist. 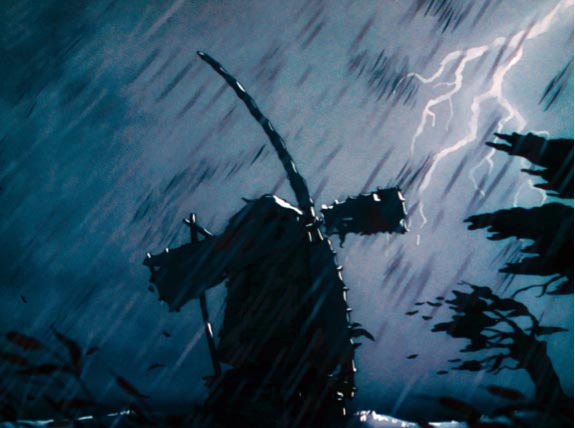 This specialized group of effects animators were able to bring a visual standardization to elevated quality by contributing their talents to some of the most memorable moments in the studios early animated feature films. Notable examples include the ocean water effects from the Monstro the Whale sequence in Pinocchio, all of Fantasia, and the forest fire in Bambi. The effects artists developed realistic representations of rain, fire, water ripples, lightning, reflections and other natural atmospheric and environmental phenomenon often combining hand draw animation with optical camera effects. The special effects enhanced the stunning backgrounds that were painted for the short, many of which were created by Disney Legend Claude Coats. 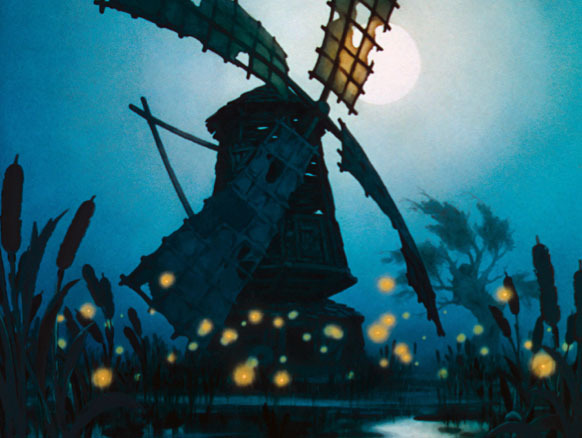 The Old Mill was, more than any animated film up to that point, a true background film. It was those beautiful scenic paintings that captivated the audience creating a tone and mood that outweighs the animation more than any other. It was, according to Coats, in an interview, “I think it kind of opened the door for some scenes to be appreciated for just their scenic value, especially through Snow White, and that same idea went into Pinocchio too.” The backgrounds he created had the ability to combine mood, light, and color in a way that created an emotional corollary, a visceral reaction for the viewer. These scenic moments helped establish the feeling and atmosphere in a scene contributing to the visual storytelling in a way not experienced before. 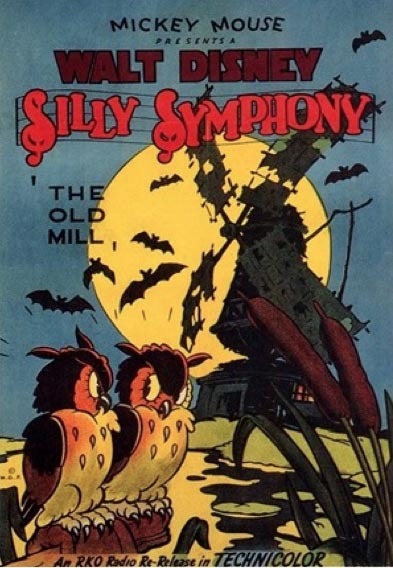 The Old Mill is the first film to use the famed Disney multiplane camera that added the illusion of three- dimensional depth to the animated films. A great example of that depth is right at the beginning of the film which opens on a foreground spider web complete with glistening dew drops, which then rake-focuses to the distant mill as the camera pushes in. The multiplane camera also allowed for the use of special optical effects such as complex top and bottom light effects; and the use of ripple glass, which were plates of optically clear glass that had special patterns ground and polished in them to achieve various types of rippled distortions when artwork was filmed through them. The camera was labor intensive to operate with as many as ten cameramen working to set up each frame. Ub Iwerks had invented a series of switches that each operator had to flip once they took care of their task on each frame before the cameraman could expose that frame of film. 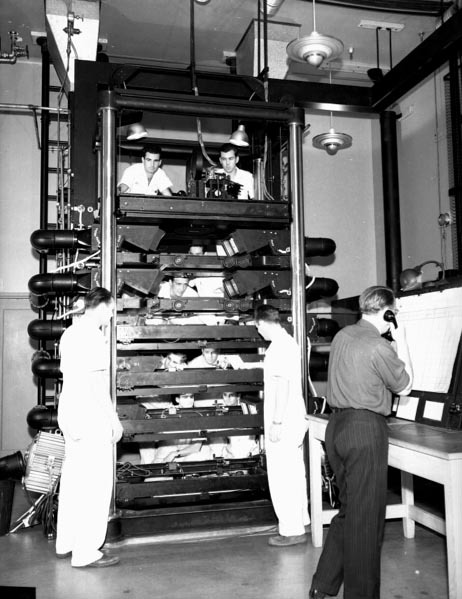 In its heyday, the multiplane camera was being operated twenty-four hours a day with three shifts of camera operators. The multiplane camera was used for over fifty years on Disney animated feature films from Snow White and Seven Dwarfs to The Little Mermaid. It was replaced by digital technology with the Computer Animation Production System known as CAPS. The Old Mill won the Academy Award for Best Animated Short Film of 1937and a Scientific and Technical Academy Award for the multiplane camera. The short was added to the National Film Registry in 2015. On the eightieth anniversary, The Old Mill still enchants and maintains its captivating beauty and charm as a timeless animated classic. Love The Old Mill. The special effects are amazing. Showing the old mill and the little critters that reside within – each dealing with the severe thunderstorm ravaging the Dutch countryside, ending with a spectacular lightning bolt – is simply a marvelous achievement. The short’s message, I suppose, is “Life Goes On”. And though the old mill here got damaged by a horrific storm, Disney’s Silly Symphony The Old Mill itself, will live for generations to come. I’m curious about your reference to Ub Iwerks having input into Disney’s multiplane camera, as he had created his own multiplane camera for his own studio (it was horizontal rather than vertical and made from car parts) years before Disney’s, and he didn’t return to Disney until 1940. Was this an improvement he made after his return? Yes, the switch safety referenced was an improvement Iwerks made after he returned to Disney. The Disney multiplane camera was designed by Bill Garity. Nice article, Dave. I love that word “vesical”. 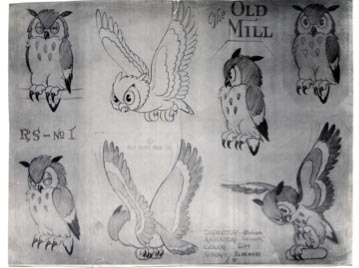 That’s Charlie Thorson’s model sheet of the owl, he sure got around to all the cartoon studios, both west and east coast. He also designed owls for Chuck Jones at Schlesinger’s. I prefer visceral. Yes, the owl is remarkably similar ones in other cartoons. Very informative article on this history of this very beloved short. I remember first seeing The Old Mill on The Disney Channel in the mid-1980’s when I was a wee kid. It really had an impact and stuck with me all these years above many cartoons that flashed before my eyes. I loved the spooky vibe of the mysterious eyes in the dark, the rats, bats and owls, only to find out that they weren’t so spooky after-all. They were just trying to live their normal lives despite the shared disruption of extreme weather events. You captured my thoughts exactly when you wrote, “There is a perfect cohesiveness to this musical arrangement and accompanying picture”. Along those lines, I often wonder who sung the harrowing background vocals? I’ve seen The Old Mill officially released on the Disney Treasures Silly Symphony DVD collection, with a higher quality/bit-rate SD version available on the Bambi blu-ray. 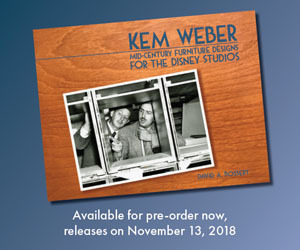 Is there any further information available on this short in the Walt Disney’s Silly Symphonies: A Companion to the Classic Cartoon Series hardcover book? I’ve been eyeing this book for a while. I need to take the plunge. “The Old Mill” was the very first cartoon showed on the very first edition of “The New Mickey Mouse Club” in 1977. Certainly the image of the old mill was inspired by the original Universal “Frankenstein.” It’s the same shot.